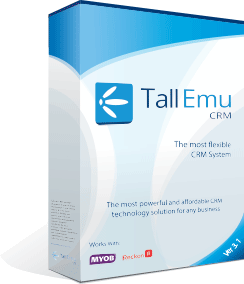 Tall Emu CRM integrates with almost 80 phone systems (PBX) giving Tall Emu CRM powerful call-centre features. It provides CRM users with streamlined telephone services from within CRM, preview information before the call is answered and streamlines data entry. When a phone rings, if the caller’s details are inside CRM, a small preview window is shown with the caller’s name, company name and who they normally work with. Recent emails, phone calls and other messages. It’s possible to click links in this window to open related CRM records automatically. Starting in version 3.1 all inbound and outbound calls made from your companies’ phone system are logged in CRM with no action on the part of the user. This facility massively reduces the effort involved in correctly recording your interactions with clients. Call Legs – answered by, transferred to. For example – if a receptionist answers the call and spends several moments talking before transferring to sales this time can also be tracked.